This Arugula Wheat Berry Salad with Citrus Vinaigrette spawned as a necessary counterpart to an autumn butternut squash bisque for last week's dinner party menu. 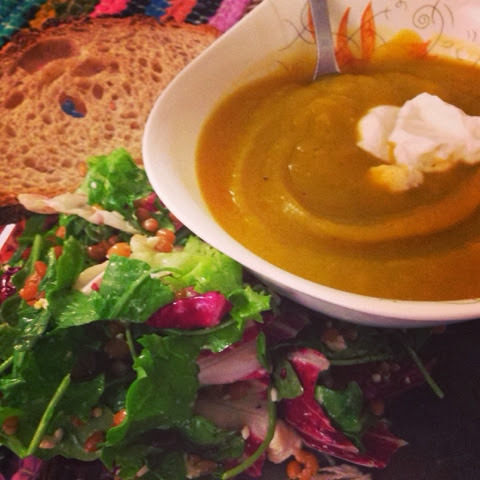 Knowing the butternut squash soup would speak for itself, I set out to create a simple salad, autumn inspired as well, to subserviently accompany the standout soup. Much to my surprise, the salad proved to be just as much of a hit. Arugula is as common of a green as they come, but it was the use of seasonal radicchio—which I have to admit I often shy away from out of sheer unfamiliarity—that hearten this salad to a whole new depth. The diverse display of lettuces are gently coated in a fragrant orange-white wine vinegar dressing, and the citrusy flavors of the dressing against the bitter, spicy leaves could not be more mellifluous. You could end the salad right there, simple and elegant. However, one thing I loved about this salad was its capacity to keep germinating into it's own main dish, if desired. Since it was being paired with the thick bisque, I chose to pebble my salad with only 3 add ons: crunchy wheat berries, oniony scallions, and salty crumbled feta. But after the soup was gone and the leftover salad became tomorrow's dinner, I added white kidney beans, sliced apple, and dried cranberries for a robust suppertime meal. Wheat berries, although one of the most time-consuming grains to cook (they really do take at least a full hour), are also one of the most enjoyable to eat. Their crunchy, spunky texture is fun to chew, with a firmness that complements the delicate salad leaves nicely. One could argue that a simple soup and salad is not the most sophisticated menu for guests, but a hearty squash stew (pumpkin works too) accompanied by this lovely bitter yet acidic salad is flavorful, comforting, and homey all at the same time. Serve with the most rustic loaf of fresh bread you can find, sliced thickly, and you have yourself a true winning supper. 1. 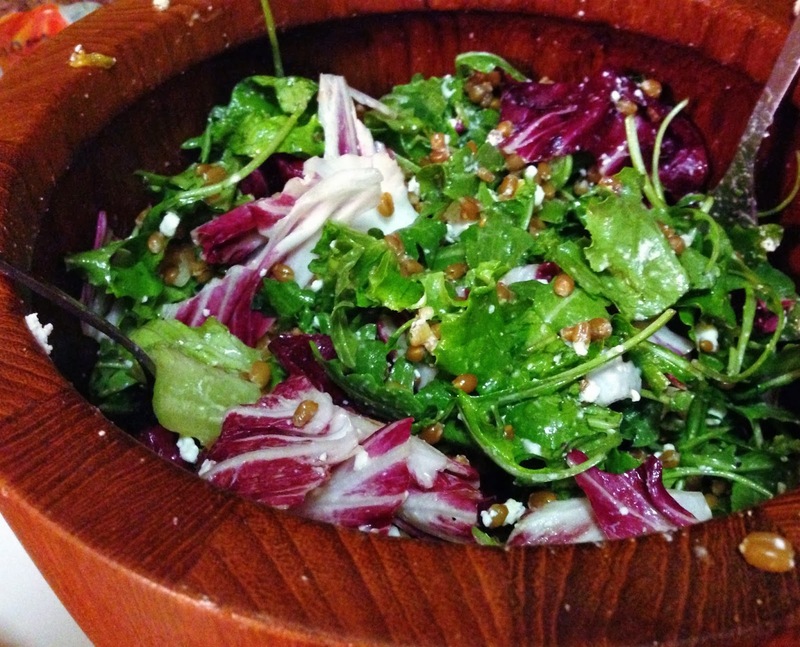 In a large bowl, toss together radicchio, arugula, and escarole or romaine. Add the wheat berries, scallions, and crumbled feta. 2. Make the dressing. In a small saucepan, reduce orange juice to a glaze. When juice has reduced and thickened, remove from heat. In a small bowl, combine the cooled orange juice, olive oil, vinegar, and ample salt and pepper. 3. Just before serving, dress salad. Sprinkle with additional chopped scallions and feta on top.